Explore royal history with a visit to Windsor Castle, dating back to the 11th century it is the queen’s official residence. Over 39 monarchs have called this castle their home since the 11th century. You can see the changing tastes in décor over the centuries when you visit the luxurious State Apartments. The State Apartments house countless antique works of art, such as paintings by artists including Leonardo De Vinci and Rembrandt. Windsor Castle is home to Queen Marys Dolls House; one of the most fabulous dolls houses in the world. Admire the intricate details from the miniature library featuring tiny books made by famous authors such as JM Barrie who wrote Peter Pan, to the miniature working lifts. You can also visit St Georges Chapel, the final resting place for several monarchs, including Henry VIII and the Queens Mother. Take time to walk around the chapel, and read through the memorials that are on display. Wander around the World Heritage Site and be captivated by this unique creation. The monument first took shape 5,000 years ago.and its purpose has been the subject of an abundance of theories; was it designed as a religious temple, an astronomical clock or even a Bronze Age burial ground? Decide for yourself whilst discovering the history of this mysterious monument. To save you time, money and the struggle of finding somewhere to eat, our tour also includes a totally tasty Lunch pack! Avoid wasting time waiting for a meal in a restaurant - it means you can make the most of each stop and won’t waste valuable exploring time. 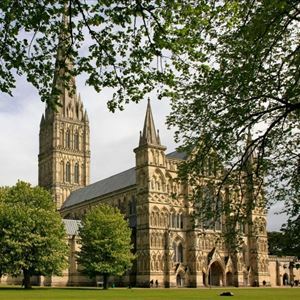 Sample the splendour of Salisbury! Soaring into the skyline, the spire of Salisbury Cathedral stands at a whooping 123m (404ft)! Erected 800 years ago, the revolutionary spire is considered one of the leading examples of Early English architecture. Mixing the old with the new, discover the fantastic font, the latest addition to the cathedral. Designed by William Pye, its sculptured splendour mirrors those which reside at Highgrove, the residence of Prince Charles. Marvel at the Magna Carta! See the famous agreement made between King John and his barons at Runnymede in 1215, which lies in the Chapter House. Standing proudly on the slopes of the River Avon, beautiful bath was the first city in England to be designated an UNESCO World Heritage site. The gorgeous 15th century Bath Abbey, the stunning Georgian architecture, the romantic Pulteney Bridge, modelled on Florence's Ponte Vecchio, are all sights to linger on in the memory of your day. Enjoy some free time to explore the wonderful city. Estimated arrival time back in London is around 8:00pm. On 18th May 2019, Windsor Castle will be closed. On 21st April 2019, Windsor Castle will not open until 1pm. Queen Mary's Dolls' House at Windsor Castle will be closed to visitors from Friday, 6 July, until further notice. You must bring the e-ticket provided to gain entry to this tour. Windsor Castle is a working royal palace and planned closures/disruptions may be subject to change. Please view the Schedule tab above for full information on closures. On 18th of June due to Windsor Castle closures, this tour will visit Henry VIII’s former residence – Hampton Court Palace instead. During Peak Periods, Additional Vehicles Without Wi-Fi May Be Used. When the State Apartments are closed the Precincts, Queen Mary’s Dolls’ House and the Drawings Gallery will continue to be open. Enjoy an exclusive 25% discount on guide books at Stonehenge**!